TV5 posted solid ratings across key regions for its weekend programs last April 28. Based on Nielsen TV Audience Measurement Arianna ratings, the Kapatid Network broke into the Top 5 of NUTAM Top Daytime Programs with Sine Ko Singko Weekend and Loko Moko U tied at number 5. The popular movie block earned a 3.7% AMR with its Tagalog-dubbed feature of the blockbuster-animated movie Shrek the Third while the fan-favorite gag and sketch show posted similar ratings. Another Sine Ko Singko feature, Eragon, landed in the Top 10 spot with a 3.3% AMR while Magic? Gimik! followed with 3.2% AMR. TV5 Kids’ animated features Sym-bionic Titan and The Amazing World of Gumball round up the 12th and 13th spot. TV5 also fared well with its Sunday primetime shows. Talentadong Pinoy Worldwide and Istorifik Kwentong Fantastik month long story “Robin Dude” were tied at number 10 with 3.4% AMR. TV5’s airing of the 2013 PBA Commissioner’s Cup Semi-finals match-up between Barangay Ginebra and Talk ‘N Text Tropang Texters made it to the Top 15. In Visayas, TV5 dominated the top daytime programs with nine shows finding spots in the Top 15. Similarly in Luzon and Mindanao, TV5’s daytime and primetime programs bested GMA’s shows. Leading the way were Loko Moko U and Istorifik Kwentong Fantastik. 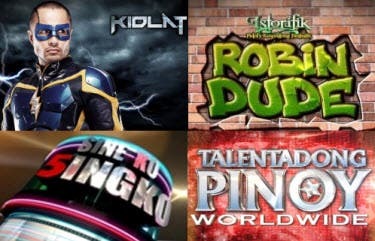 TV5’s strength lies in its family-friendly programs such as Sine Ko Singko, Loko Moko U, Talentadong Pinoy Worldwide, Istorifik Kwentong Fantastik and Kidlat. These shows are not just fun and entertaining but also appropriate for its intended market, encouraging co-viewing among family members. With new show in development, audiences can expect exciting and dynamic programs that are sure to engage the whole family. Dios mio!rating na ba yan eh mas mataas pa ang rating ng umagang kay ganda ng abs cbn jan..morning show pa yan ha!